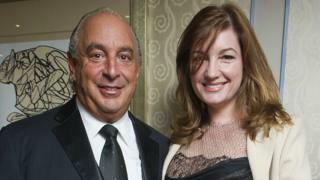 Baroness Karren Brady has resigned from Sir Philip Green’s retail empire, just weeks after vowing to stay in her post despite a harassment scandal. Taveta, the holding company for Sir Philip’s Arcadia group, said she had stepped down as its non-executive chairman, but gave no reason. She had been chairman since July 2017. It comes after allegations of sexual harassment and racial abuse of staff by Sir Philip were reported earlier this month, accusations he strongly denies. Baroness Brady had said she felt “a real sense of duty” to staff at the retail empire, including her own daughter, Sophia Peschisolido, who has been a social media content assistant at Topshop since 2016. Ms Brady was made a life peer in 2014 and sits on the Conservative benches in the House of Lords. She also runs a business leadership firm through the website strongfemaleleadership.com. The firm said Sharon Brown had also resigned as non-executive director of Taveta. “Taveta thanks them for their contribution and wishes them well for the future,” the company said. Baroness Brady’s seat at the head of the Taveta board has been an uncomfortable one ever since she became chair in 2017. Putting one of Britain’s most high-profile businesswomen at the head of a board on which she had served since 2010 was seen a shrewd appointment in the wake of the collapse of BHS. She has described herself as being “tough” and has regularly spoken out against men who abuse their power within organisations, subjecting women to inappropriate behaviour. The recent revelations of substantial payments of hush money to keep allegations against Sir Philip of sexual and racial harassment quiet therefore made her position very awkward indeed. Until recently, she told the BBC that she continued to chair the company out of a “sense of duty” to the thousands of Arcadia employees – 85% of whom are women. It seems that sense of duty has finally worn off as she announced she was stepping down along with non-executive director Sharon Brown. Having weathered the media storm around Sir Philip Green’s conduct and the use of non-disclosure agreements for several months, questions will naturally arise as to why they are both stepping down now. Sir Philip Green has always insisted that there was nothing in his conduct that was unlawful. With both business associates and board members jumping ship, it seems that while not unlawful, it has made him deeply unpopular. Earlier this month, Sir Philip dropped legal action against the Daily Telegraph newspaper, which had been prevented from publishing accounts of his alleged misconduct towards five employees. The paper subsequently reported that he paid a female employee more than £1m to keep quiet after she accused him of kissing and groping her. After the allegations became public, Baroness Brady came under pressure to step down from her post at Taveta. But she responded by saying that she would stay in her post because she felt “a real sense of duty” to the people working at Taveta. She said at the time in a statement issued through her public relations team: “I want to be 100% clear – I have always been an outspoken defender of women’s rights in the workplace and always will be.